Of all the pieces Freer chose to display on the shelves of his Peacock, or Blue, Room, this large shallow "dish on a low foot" most closely references the original blue and white china which appeared in the room's original incarnation in London. 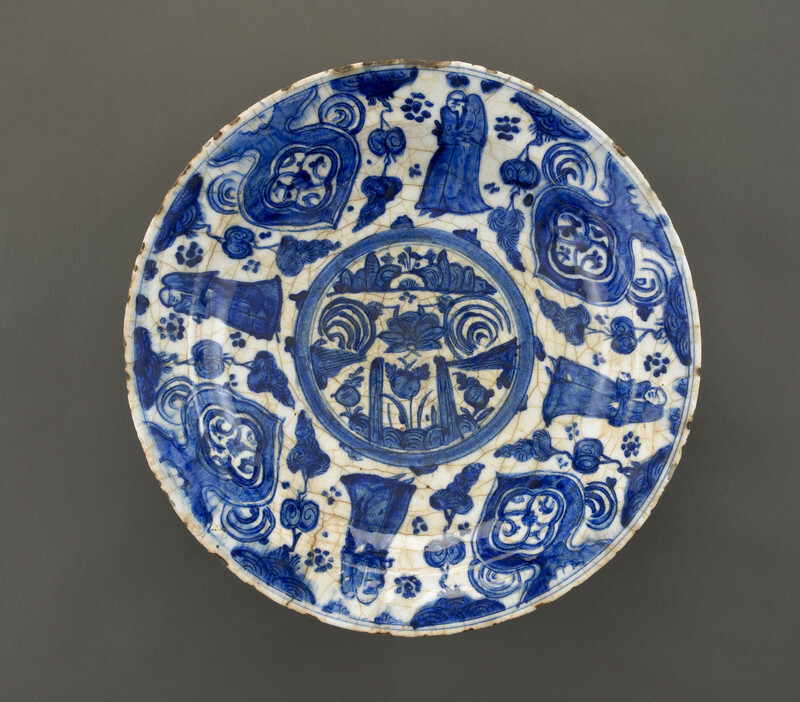 This ornately patterned Safavid dish was not typical of the Asian ceramics Freer was attracted to, or indeed collected. In his object notes, he wrote about the piece, "For comparative study only." He purchased it from the Paris dealer, D.G. Demotte, of whom not much is known. What is clear, however, is that Freer selected this Iranian bowl of the Safavid period for inclusion among his other items of Near Eastern and Asian ceramics-perhaps to highlight, through contrast, the formal and chromatic qualities of the less decorated, more subtly colored surfaces of the rest of his collection. "Dish on a low foot," in The Peacock Room, Freer Gallery of Art, Smithsonian Institution, Accession No. F1904.151, Item #3168, http://www.peacockroom.wayne.edu/items/show/3168 (accessed April 19, 2019).